Tomorrow is a very exciting day. I am going to a cake tasting. Poor Jake has to go to work while my sister (my maid of honor) and I go stuff our faces with yummy bites of cake. My first stop on the sweetness train is at take the cake. 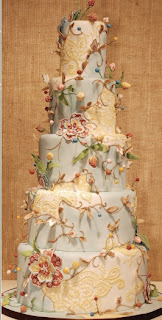 They have a lot of photos of cakes with delicate, soft details that I love. I don't really want anything that has a big POW of color. 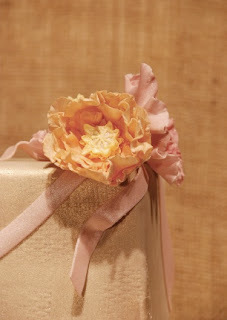 An off-white cake like that first one with that big sugar ribbon wrapped around it, and the ends meeting at that gorgeous flower. I was able to give take the cake a little test run at a wedding show that I attended last weekend. My mom, sister and I tried a few little cupcakes- vanilla with whipped vanilla frosting, chocolate with chocolate ganache filling and chocolate frosting and carrot cake with cream cheese frosting. Verrrry tasty. I could have skipped the fancy lunch and just ate cake and drank champagne all afternoon. On another note, I am totally done with those shows. No matter how fancy it is, you are still paying to walk into an advertising trap. Anyone with me? I also plan on spending some time with the Cake Girls, the Turano boys and at the Sugar Syndicate and Bittersweet. The Cake Girls are pretty much the cake queens of Chicago and apparently their talent has been recognized by FoodTV. They couldn't book a tasting with me until April because they are going to have their own show- like Duff! 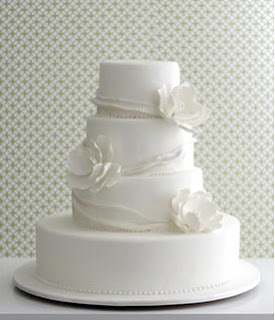 Any other recommendations for cake bakeries in Chicago?